Augustine Kofie was in charge of inaugurating the walls of the gallery with his exhibition Yesterday’s Advance | Avances del Ayer. In it, he depicts a moment, an experience, materialized into tangible artworks. 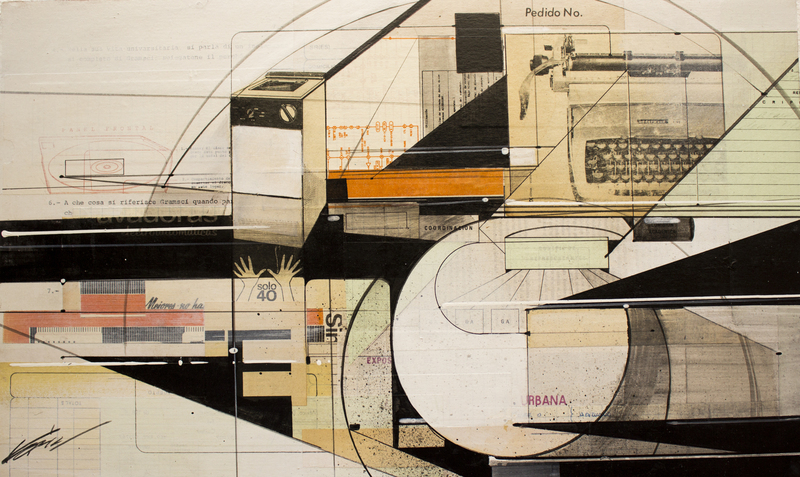 Every piece is a result of his recent residency in Mexico City. 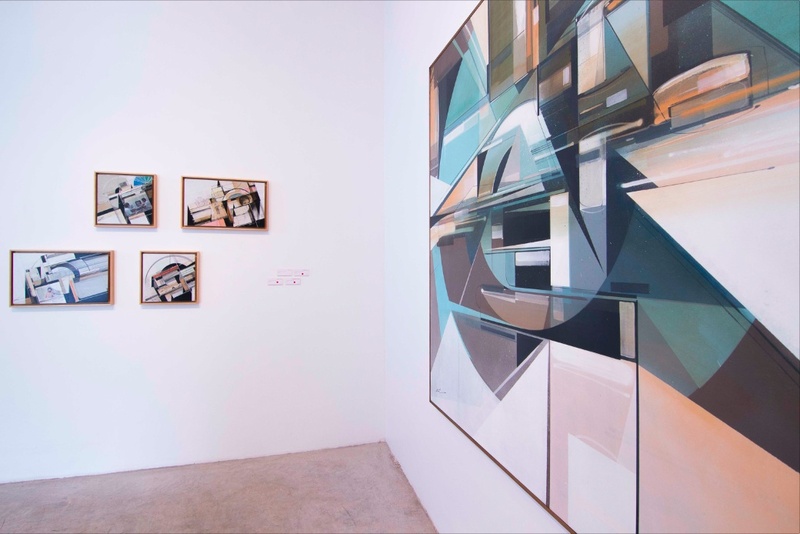 His use of recycled materials, geometric composition, collages, a mixture of paper and ochre tones, emphasize the Californian artist’s experimental nature as the main creative agent in the pieces of Yesterday’s Advance | Avances del Ayer. 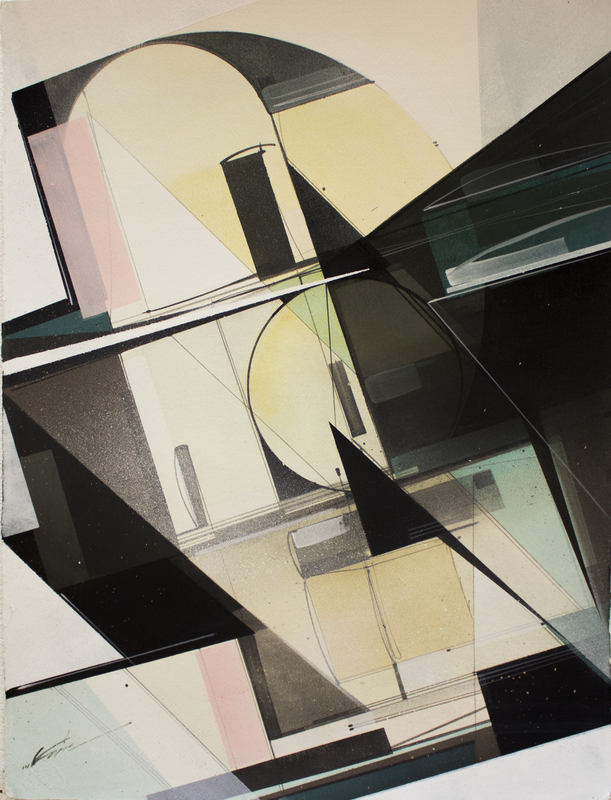 Kofie portrays his fascination for structures and architectural forms through the use of earth tones to create a modern dynamism in the composition, a style he calls “vintage futurism.” Renowned in the urban art world for the quality and detail of his pieces, Kofie portrays his obsession with perfect angles and his immaculate linear work by reviving the washed out colors of certain façades, damaged by time and history. 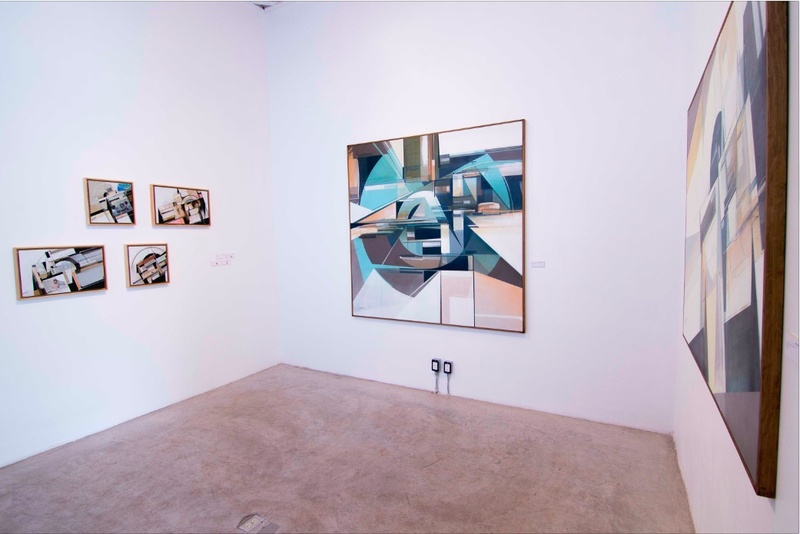 The peach, cream and turquoise tones of the Porfirian buildings of the Roma and Condesa neighborhoods, as well as the art deco architectural ensembles, are – consciously or unconsciously – the core of the pieces presented in this exhibition. 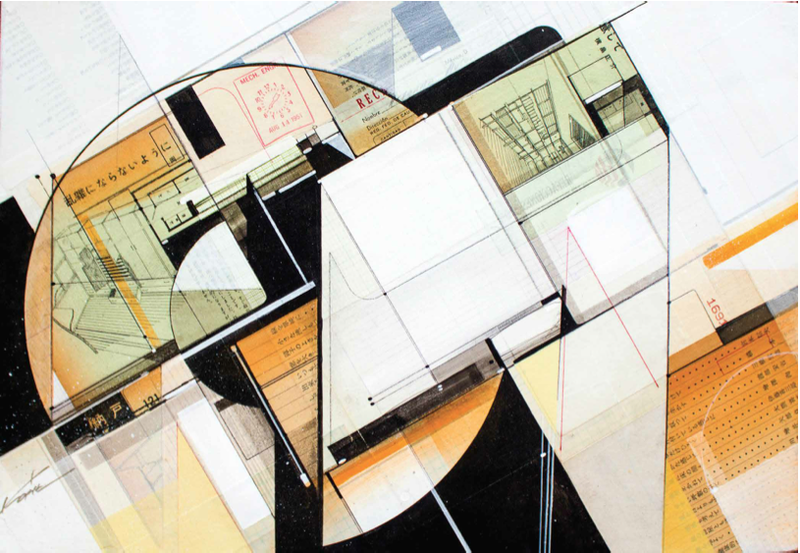 Inspired by the basic building blocks of the geometric world, Augustine Kofie has formed a retro-futuristic aesthetic which transplants these shapes and angles into a soulful, organic, yet highly mathematical form of abstraction. Merging his traditional graffiti education, his inclination toward “certain colour forms and certain application techniques”, with his deep love of illustration and preliminary design, his fondness for “drafts, architectural renderings and pre-production concepts”, Kofie plays with form and line, with balance and depth, twisting and manipulating his murals, his illustrations, his compositions, into ever new and dramatic arrangements. Developing his aesthetic into an almost pure abstraction then, dominated by the simple squares, triangles and circles that make up our structural universe, Kofie’s relentless desire to experiment and explore his visual surroundings meant he was forced to engage in a constant test of his own mindset and preconceived ideas, each work an attempt to find a geometrical solution to a graphical problem. Putting his entire soul into his work, into his craft, Kofie has thus formed an intensely layered, earthy, dynamic style of contemporary muralism, an illustrative practice which digs deep and looks forward, a practice, like the Roman God Janus, which surveys the future and the past at very the same time. 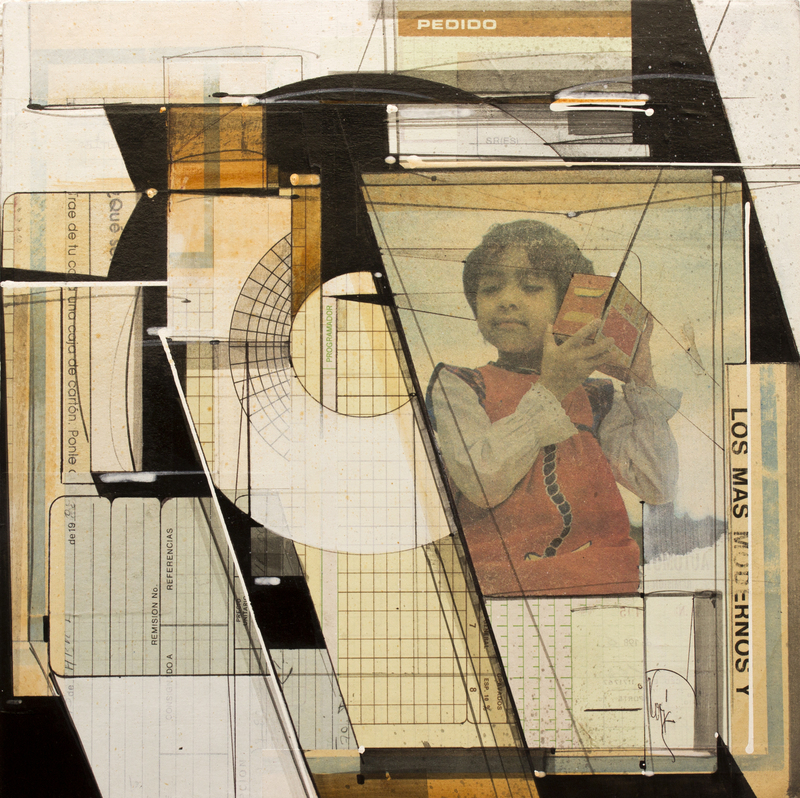 His work has been exhibited in museums and galleries such as Celaya Brothers Gallery in Mexico City (MX), Magda Danysz Gallery in London (UK), Jonathan LeVine Gallery in New York (USA), in the A+D Museum and The Chinese American Museum in Los Angeles (USA), and the Pasadena Museum of California Art in Pasadena (USA. ), among others.